It’s too bad we don’t count thread usage in our Stash Report. Look how many spools I emptied from my thread stash while making all those cloth shopping bags! Our PTA Christmas Fair was great! I set some of the bags out on a long table and displayed others on a coat rack. They looked really cute hanging up and attracted a lot of attention. I sold almost all of my bags, and the fastest sellers were the ones made with very bright fabrics and cute dog and cat prints. This was a very good fund-raising activity! And now I’ve met my goal of using 100 yards (net) of fabric this year! Thank goodness for the bags project. That has helped a lot! Please visit Judy’s blog if you would like to see how other quilters are doing with stashbusting this week. on December 6, 2009 at 1:02 pm | Reply katie z. Well done on busting thread too! I’m impressed that you made your goal – and you have 3 more weeks to bust more, if you want. Congrats on reaching 100 yards used. great job on busting over 100yds so far for the year! I am keeping up with my thread usage but not doing nearly as good at using it up as you I see. Wonderful that your bag all sold. I need to find a project like this to bust a lot of my stash so I can finish the year with a positive number! You did a great job. 9 + yards for bags! Think of all the plastic bags you prevented from going to landfills! I hope I do that well next year. Anxious for January to start, so I can join in the fun! Congrats on making your goal… now for the next challenge! Wow. 100 yds net, plus all the thread. Make sure you stay out of fabric stores for the next few weeks. Great going. Bravo! What a great way to use up your stash and benefit your child’s school at the same time. 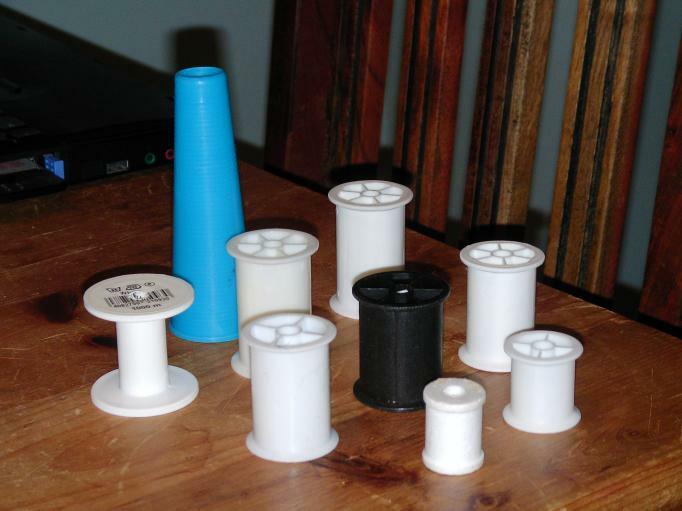 I love empty thread spools. When I was teaching nursery school Iused to bring them in for my class. The children loved using them to build and create new inventions. Thank you, everyone. If it wasn’t for the shopping bags which used 5/8 yard each, I wouldn’t have made it. Next year I am going to try to reach that goal with quilts only! Eileen, I was thinking of you with the empty spools! You are the first person I know who started keeping track of that. 🙂 I had actually tossed two in the bin and then retrieved them! Take care all, and thank you very much for your comments.